Techmeme’s new popular list product Leaderboard launched today, and the reaction has been interesting. Some are suggesting that it’s not a representative list, others (well Scoble) are suggesting that it is the death of blogs. First the big news: more Meme Leaderboard products are on the way, with Leaderboards to be launched for Gabe Rivera’s other sites Memeorandum, WeSmirch and Ballbug. Like the Techmeme Leaderboard these lists will focus on the popular blogs in each respective area; politics, celebrities and baseball in that order. There are no plans as yet to launch a combined list, although Gabe liked the idea when I suggested it to him. The new Leaderboard sites will be launched over the next week. In noting the new Leaderboard sites, it highlights the very nature of the product: these are popular lists based on verticals, not an all-up list such as the Technorati Top 100. In one respect they are not direct competitors, yet the continued decline of Technorati has left an opening for competing popular lists, and in this regard the Leaderboard products have their place. As vertical lists they are by their very nature unrepresentative of the entire blogosphere because they only track a particular vertical, and I don’t think there is anything wrong with that. The cliques in blogging have been long established, and at the end of the day many will find personal interest in reading a list of the top 100 blogs in their own favorite vertical. Where as I might prefer a tech lists, others might prefer politics or celebrities; choice in this example is a good thing. The argument that the list (by Scoble) is representative of the death of blogging couldn’t be any further from the truth. As the graph shows, 64% of the list is held by blogs. When we look at the non-blogs, it gets greyer, because many of the online publications (13%) and mainstream media sites (17%) either have blogs or are using blog like features such as comments. Scoble’s argument that most of the 64% that are blogs aren’t real blogs as they are written by more than one person is perhaps one of the weirdest propositions I’ve heard this year. I’ll accept that a blog is only a blog if it has comments (which they should) but since when did a blog stop becoming a blog because there are multiple bloggers? If anything, the strength of multiple author blogs demonstrates the growing maturity of the blogosphere, in that to be at the top, leading blogs have adopted to the 24/7 news cycle by bringing in additional bloggers to cover breaking events, and to provider a richer, and perhaps more comprehensive coverage of news events. This is not to take away from single-author blogs at all; I was at a conference last week where a Professor told the audience that group blogs are the future of blogging and I publicly disagreed: single-author blogs are and will always remain the bread and butter of the blogosphere, however expecting that single author blogs will dominate links and traffic is akin to running a Mini into a B-Triple Truck: the truck will nearly always win. 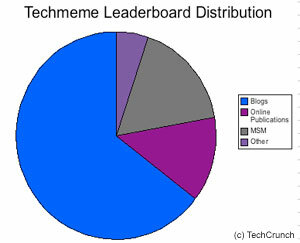 Note: The Techmeme Leaderboard Distribution graph is based on Dave Winers list here. Given the updating nature of the product the distribution will constantly change over time.